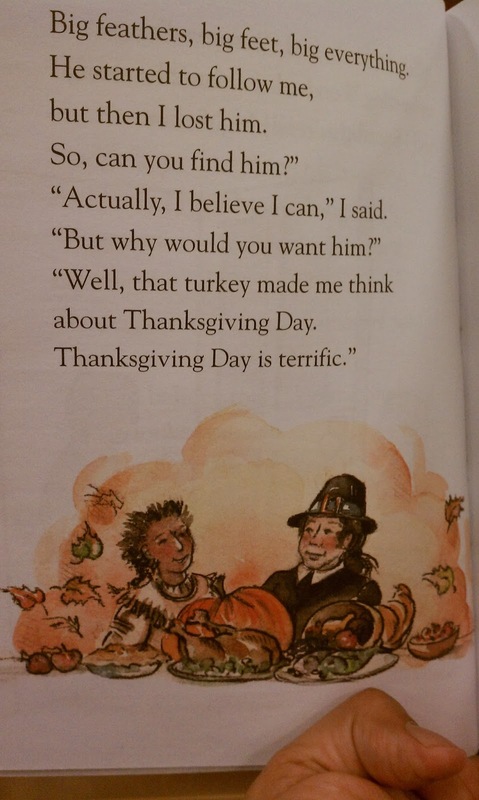 Are you looking for children's books about Thanksgiving?!! The exclamation points convey my frustration with the insistence that this holiday be one in which people want Thanksgiving to be about Pilgrims and Indians sitting down to eat a meal together--nevermind what happened to Native people before or after that! Did you know, for instance, that Tisquantum--more commonly known as Squanto--could speak English because he'd been kidnapped by a prior expedition and sold into slavery in Europe? And did you know that before the Mayflower arrived, the Wampanaog people had been devastated by disease from earlier European visitors? 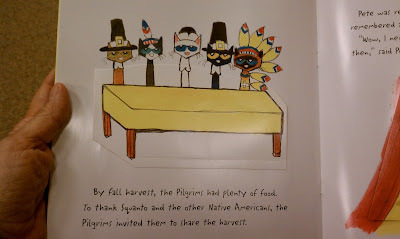 If you've written to me or to other Native critics, educators, or librarians, to ask for children's books about Thanksgiving, it is likely because you want to give the children in your care or in your classroom something better than the standard Pilgrim/Indian story where everyone sits down to a lovely dinner. 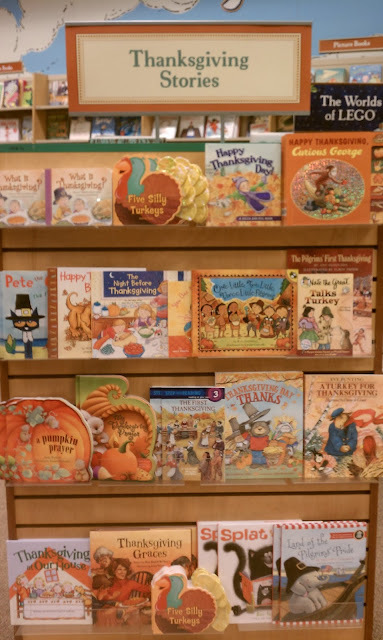 Prompted by readers of AICL, I took some time today to head over to the local B&N and see what kind of books about Thanksgiving they might have on display. Following the success of What Is Christmas? and What Is Easter?, Michelle Adams brings the same humor and warmth to this little Thanksgiving board book. 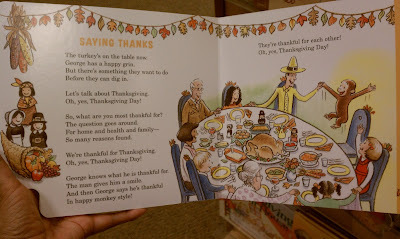 Through the whimsical art and rhyming verse that's fun to read, even the youngest child will come to understand that Thanksgiving is really about showing gratitude for all the blessings in our lives. I don't know about that... Doesn't seem right to just omit Native people, but I don't want the stereotypes OR the feel-good story, either. Sometimes I think that Thanksgiving books for young children should just focus on things people are grateful for. What is Thanksgiving? 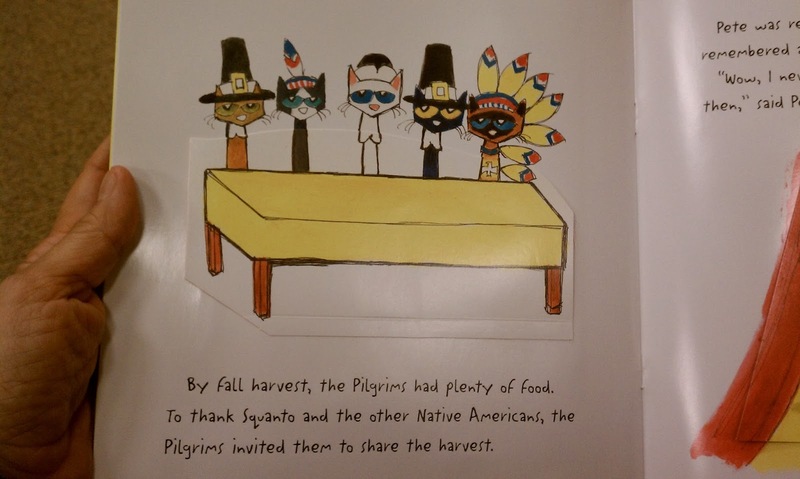 tries to do that, but having Pilgrims (and a turkey) but no Wampanaog people just doesn't seem right. Five Silly Turkeys does not have Pilgrims or Indians in it. Happy Thanksgiving Day by Jill Roman Lord is a 'touch and feel' book (for those of you who don't know what they are, touch-and-feel books have textures embedded in each page that young children can touch, thereby having a multi-sensory experience). Published in 2013 by Ideals Pub, this page shows the little boy's artwork taped to his wall. See? Pilgrims, but no Indians (the bear's belly has a swatch of fabric for a child to feel). See the Indian figurines in the left margin? They're also on the table. Those things on the back of everyone's chair are turkey feather decorations that George made. Happy Thanksgiving, Biscuit! by Alyssa Satin Capucilli, illustrated by Pat Schories, came out in 1999. Like Pete the Cat: The First Thanksgiving, it is from HarperFestival. I like the Biscuit books. He is so cute! In this lift-the-flap book, there are no Indians or Wampanoags. There are, however, Pilgrim dolls. See the man propped up against the bench that has Biscuit's food dish? The woman is face down by Biscuit's hind feet. The Night Before Thanksgiving is about a family getting ready for Thanksgiving. No pilgrims or Indians, either. Dare I say it? "Thankfully!" Some people really object to my being snarky. Ah well. I don't know what happens later in the book. Maybe they're going to catch it, but I kind of doubt they'd kill and eat it. The last book on the second shelf is The Pilgrims First Thanksgiving by Ann McGovern. Illustrated by Elroy Freem, it was published in 1993 by Scholastic. Partway through the book, we're introduced to Squanto! 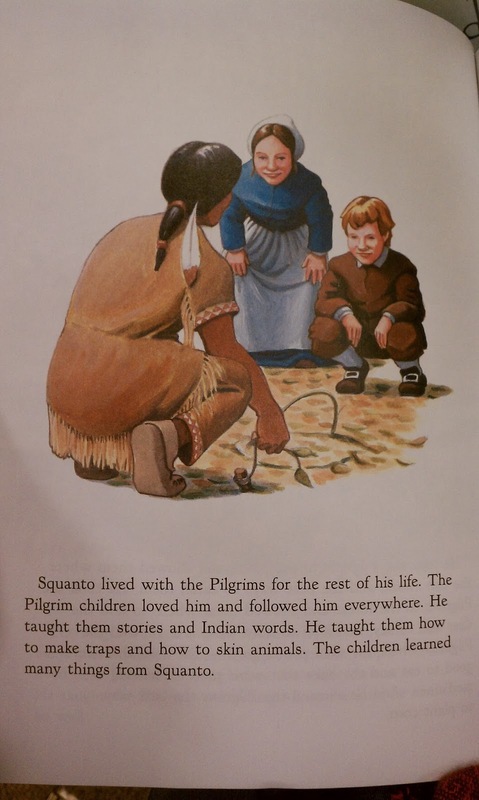 On the page just before this one, the text tells us that the Pilgrims made a good friend who helped them, and that his name was Squanto. I wonder what children today learn about Squanto? 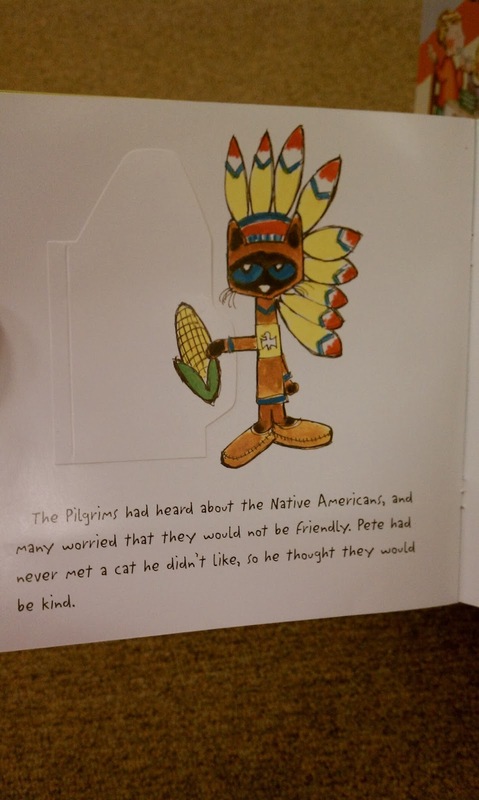 Given that November is Native American Month, it is depressing to see how Native peoples are depicted (or not) in these books. I'm going to stop here and leave the last two shelves and another book that was on the backside of the display, for another day... Your comments (and pointers to my typos) are welcome! Regarding the illustrations in One Little, Two Little, Three Little Pilgrims--It looks as if the Pilgrims also have "paint" on their faces. Perhaps it's just the style of illustration and not meant to represent warpaint. I appreciate the critical assessment of the books available, but I'm still looking for a good Thanksgiving children's book that goes beyond the fairy tale. My kids are young (6 and 7) and love all things American Indian. They've watched the We Shall Remain series on PBS, and we have frank discussions about the less admirable aspects of the history of how this country came to be. 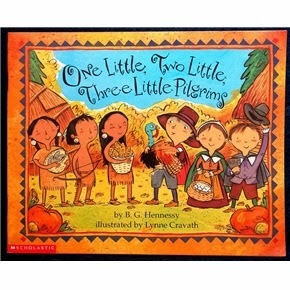 They get the typical story line at school--pilgrims and indians sharing the bounty of the harvest and their new friendship which allowed the pilgrims to survive. I'm just looking for something with more balance, but that still preserves the idea of the celebration of Harvest and being thankful for what we have. 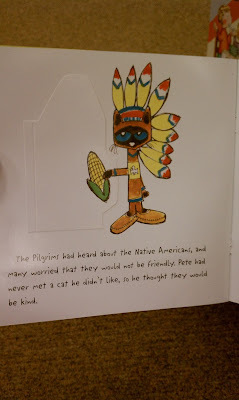 Any thoughts on good American Indian children's storybooks along these lines? 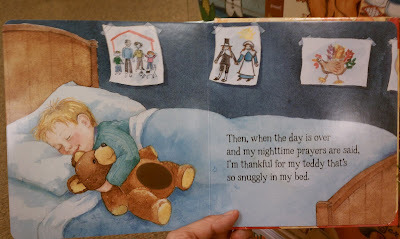 I like to use The Thankful Book by Todd Parr. The text has children being thankful for a variety of things like pets and friends. It is not religious in nature at all. The last spread does feature people around a table and the text reads "I am thankful for holidays because they bring my family together." This could be any holiday. Thank you for this information. I too wish we would be more direct about events in our history. I think Thanksgiving should just center on being thankful. But, I don't like when we paint over things just to make them look better than they were. Thanks so much for this great discussion, Debbie. We've compiled some books about Thanksgiving on Colorin Colorado that represent a wide range of cultural experiences - both historic and contemporary. Among the titles are "1621: A New Look at Thanksgiving"; "Clambake: A Wampanoag Tradition"; and "Giving Thanks: A Native American Good Morning Message" by Chief Jake Swamp. The other titles have an interesting take on the holiday - "Duck for Turkey Day" by Jacqueline Jules shares the story of a Vietnamese girl who is very concerned when her mother decides to serve duck on Thanksgiving, while "Molly's Pilgrim" explores a different perspective on what a pilgrim is through the experiences of a young Russian Jewish immigrant. I don't think any of these raise any red flags in terms of the "Thanksgiving story," but if I'm mistaken, just let me know! I absolutely agree with everything you said, and I would rather celebrate thanksgiving as a day of giving thanks rather than a celebration of a distorted history. My problem is that, as a teacher in Massachusetts, thanksgiving is one of the required history topics we are supposed to teach. I teach kindergarten, so I am unsure about how to go about this in an appropriate way while still giving them at least some information about why we celebrate thanksgiving. Any ideas? Reading your critiques caused me to ask.....What story would I share about Thanksgiving? 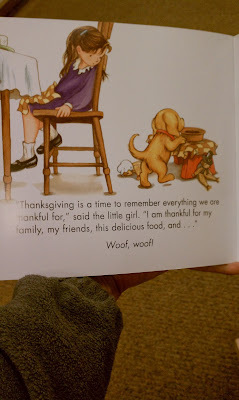 I realized that there is no story about Thanksgiving that would ever satisfy me. 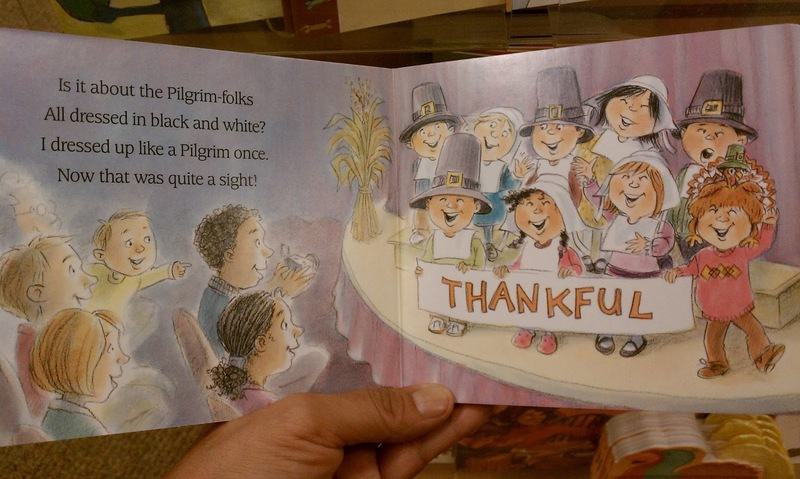 The Thanksgiving story/holiday is 100% colonial brainwashing. So my solution....I will tell stories of our peoples reclaiming the honor and dignity of being indigenous. One kids book worth writing would be about the beauty of the sunrise ceremony that occurs every year at Alcatraz. It is in this morning dance, giving thanks with the sun, that we reclaim that which the colonial creators of Thanksgiving are trying to bury. The tide will turn, the masses will learn from the people closest to the mother. The ability to rebrand a day like Thanksgiving from its ridiculous lies to an authentic beauty of healing like done on Alcatraz will become the history of tomorrow. I like the book "Thank You Sarah" because it talks about the origin of our "national holiday" not the origin of our feast. It follows Sarah Josephina Hale's efforts to get a day of thanks approved as a national holiday. I'm sure it does have a picture of a pilgrim in the beginning, I can't remember if it has a picture of an Indian.